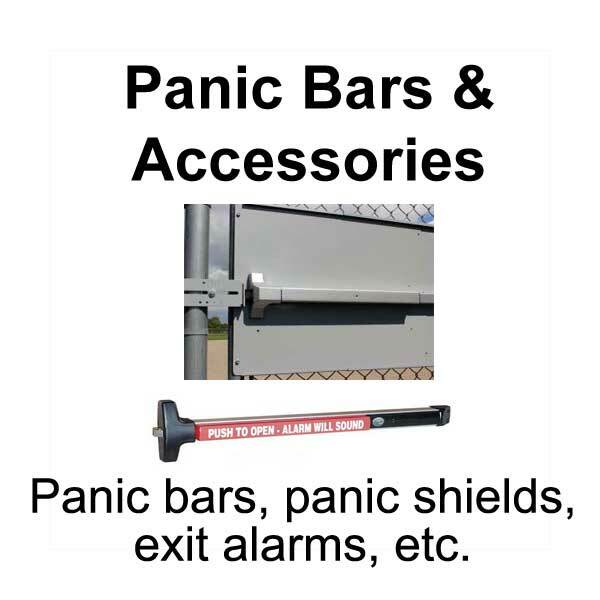 We offer a wide selection of hard-to-find keyless locks and accessories that are specifically designed for use on doors with door panic bars. 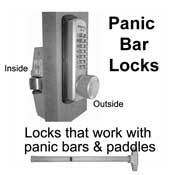 Panic bar locks are used on the outside of a door that has a panic bar, crash bar, or panic paddle in the inside. These doors can be opened from the inside by pressing the panic bar—ie, there is nothing to turn. This can be a life-saving feature in an emergency (like a fire in a theater) when a crowd is pushing against the door trying to get out. Many communities have building codes that require the use of crash bars for doors under some conditions. Check with your local fire department for information about building codes in your area. Click below to choose the type of product you want. 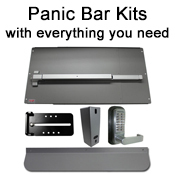 Then you'll be able to view individual locks, door push bars, kits, and other panic hardware before you choose from the available finishes and place your order.